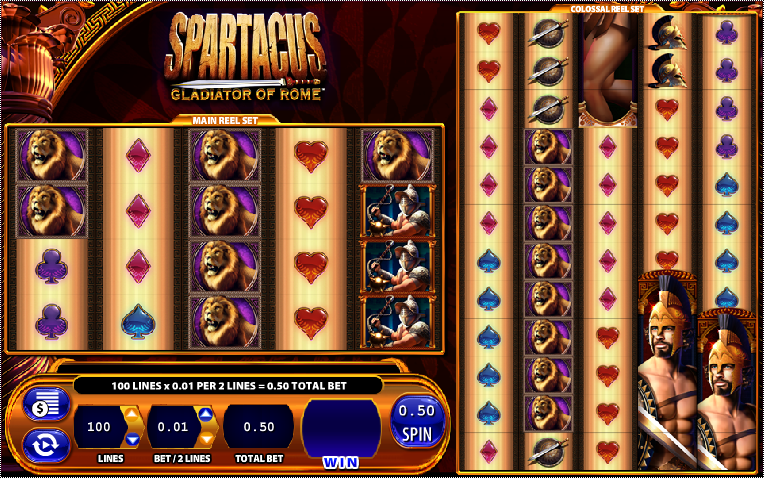 Spartacus Gladiator of Rome is an online video slot game that is powered by WMS Gaming and happens to be the second ever released that is part of their colossal reel series. The colossal reels are a unique setup with a main reel set of five reels and four rows and an additional reel set of five reels and twelve rows. The online slot game features a total of one hundred pay lines spread across both of the reel setups that run from left to right and require three or more matching symbols on an active pay line to be considered a winning combination. The theme of Spartacus Gladiator of Rome is, as the name suggests, based on the heroic slave leader who became the greatest Gladiator in Rome and stole the hearts of many people with his fighting abilities and leadership skills. The legend of Spartacus claims he vastly impacted the Roman Empire and made his mark in history which is evident by the variety of films; television shows; books and more that feature this great gladiator. The reel symbols include Spartacus himself; female gladiators; gladiator helmets; gladiator shields; swords; lions; the online slot games logo and the high valued playing card icons jack; queen, king and ace. The highest paying symbol is the iconic gladiator himself who will pay out 1 250 coins on the maximum bet when he appears five consecutive times on an active pay line. The Spartacus Gladiator of Rome wild symbols, which are represented by the online slot games logo, may become stacked when they appear and take up all of the four positions on the reel it landed on. When this happens on the main reel set of five reels by four rows the wild symbol will transfer over to the second reel set and take position on the corresponding reel. Here it will also become stacked. Once the wild symbols are done transferring and becoming stacked any winning combinations they produce will be paid out. The coliseum symbols are the symbols that represent the Spartacus Gladiator of Rome scatter symbols. These scatter symbols will only ever land on the first, third and fifth reels of both reel sets. Three or more of the scatter symbols need to appear on either reel set to activate the free spins bonus round and the number of free spins awarded is dependent on the number of scatter symbols that appear. Three of the scatter symbols award eight free spins with a 2x the bet multiplier, four scatter symbols award twelve free spins and a multiplier of 5x the bet and five scatter symbols award twenty free spins with a 20x the bet multiplier. During the free spins bonus round the wild symbols also appear stacked and transfer over to the second reel set if they appear on the first. If another three or more scatter symbols appear on the first, third and fifth reels of both sets then another free spins bonus round is activated.